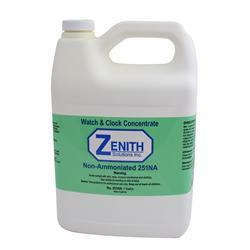 Zenith Solutions, Inc. has revolutionized the quality and performance of cleaning solutions that watchmakers and clockmakers use daily. In the late 1800’s, watchmakers and clock makers were desperate to have clean parts so they used cyanide solutions. “The solution is made up by dissolving a piece of cyanide about the size of a walnut in a cup of warm water. Once made, it should be kept in a glass jar with a secure stopper to prevent deadly fumes from escaping.” This was written in a book entitled Practical Watch Repairing by Donald DeCarle, published in England in 1969. Around the same time period watchmakers and clock makers were using benzene as a cleaning solution. You know that cyanide is extremely poisonous; we, as chemists, can tell you that benzene is carcinogenic. Both products are now outlawed by the government and cannot be used in cleaning solutions. In its place, companies who make cleaning solutions decided to put ammonia in their cleaning products because watchmakers are of the opinion that ammonia is necessary in a cleaner to give metal parts that extra luster. Unfortunately, ammoniated cleaners give off ammonia fumes. 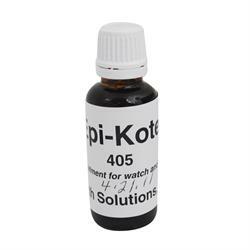 There are a large number of watchmakers and clock makers who are sensitive to chemical odors and find ammonia fumes objectionable. They have asked this chemist, if something can be done to eliminate the ammonia odor. The answer is “Yes” because the chemists at Zenith Solutions, Inc. were able to develop cleaners that are “non ammoniated” (without ammonia fumes). Thanks to Modern Chemistry there are chemicals that chemists can choose from to formulate cleaners without any ammonia odor. Zenith Solutions, Inc. is now producing cleaners that are ammoniated (without ammonia fumes). This is possible because the ammonia group is attached to a chemical that will not allow it to evaporate. The result is no ammonia fumes and the ammonia stays in the cleaning solution where it is needed to give delicate watch and clock metal parts that extra luster. The new cleaners are environmentally friendly and safe for watchmakers and clock makers to use. The watchmaker and clock maker must first determine whether the movements are uncoated or coated. This can be done by examining the metal parts under magnification with the eye loop. The coated parts become apparent because you can see a thin layer of shellac or varnish on them. Once you determine whether the parts are coated or uncoated then you can select the proper cleaning solution. We begin with uncoated parts because it is estimated that 85% of all mechanical watch and clock movements are uncoated. cleaner. It is rated low odor and will not gel in the gallon container because the plastic container is fluorinated to give the solution a long and stable shelf life. Due to Formula 67’s high solvency and micro-molecular cleaning action it will dissolve and dislodge old grease and oil from both watch and clock movements. Selecting the proper cleaning solution is important because it gives the watchmaker and clock maker the reassurance that all parts are cleaned prior to being repaired and assembled to achieve maximum performance in the workings of the watch or clock. Rinsing solutions are formulated to wash away residual debris and cleaning solution that may have adhered onto watch and clock parts after the cleaning cycle. Ideally, the rinsing solution should be compatible with solvents and chemicals that are in the cleaning solution. Today, there are solvents that are odorless and environmentally friendly that can be used in cleaning and rinsing solutions rendering both solutions compatible with each other. Zenith’s chemists have taken advantage of modern technology and as a result they developed a new rinsing solution called Drizebrite. also referred to as “The Ultimate Final Rinse”. Drizebrite is designed to leave watch and clock parts spotless without any oily film when dried at room temperature or in a heating chamber. Drizebrite restores delicate movements to their original luster after being cleaned with Zenith’s Formula 67 or Gentle Kleener. Drizebrite is considered to be “The Ultimate Final Rinse” because it exceeds all watchmakers and clock makers requirements. It took three years for Zenith’s chemists to develop a non-ammoniated water-base cleaner that is equal in cleaning power as ammoniated cleaners. Zenith’s non-ammoniated Product 251 NA is environmentally friendly and does not emit any harmful ammonia fumes making it safe for the watchmaker and clock maker to use. 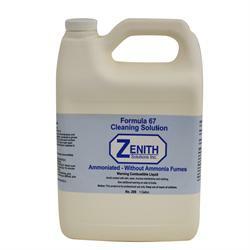 Because Zenith’s non-ammoniated cleaner is the product of choice, we are only describing the features of Product 251 NA. 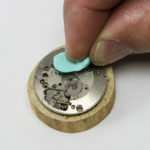 Product 251 NA is a “gentle” cleaner that will clean both coated and uncoated delicate watch and clock parts. It is ideal for repair shops that work on a large volume of clocks because it is effective and economical. One gallon of concentrated Product 251 NA makes 8 gallons of cleaning solution. Those watchmakers that repair antique watches with coated movements find this “gentle” cleaner the perfect solution. Zenith’s chemists developed Z-88 cleaner which is a superior, very effective, non-ammoniated cleaner for both the Horological and Jewelry Industries. 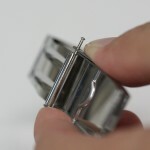 Watchmakers find Z-88 ideal to clean metal watch bands because it restores them to their original shiny state. Jewelers find Z-88 economically priced and the best product to clean jewelry with semi¬precious and precious stones. Z-88 is the perfect solution to clean buffing marks after polishing. Z-88 can be used in ultrasonic and mechanical machines or simple manual cleaning. Everyone in the jewelry and watch repair business should have Z-88 in their shop. Z-88 is concentrated and should be diluted with water 1:15 ratio. One gallon makes 16 gallons of cleaning solution. This may vary depending upon the application which will determine the required strength. 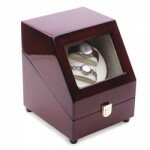 Many watchmakers are affiliated with jewelry stores and are asked to polish tarnished silver jewelry and watch casings. Dip-It is the perfect tarnish remover. You will be amazed at this fast acting silver polish. Just Dip-It and rinse with water then wipe dry. It is also ideal to clean old collectible valuable coins. Radiant makes parts Clean and Shiny. Radiant is in a class of its own because no other cleaner can compare to Product 777’s Cleaning Power. 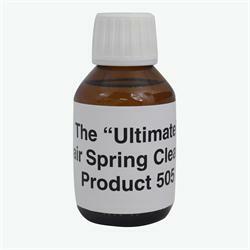 This long lasting cleaner can be used over and over more times than all the rest, making it economically worthwhile to use. Radiant is rated as a high performance cleaner that Cleans and Shines delicate watch and clock parts at the same time. After the cleaning cycle, metal parts “Sparkle”. The concept of cleaning and having parts shine simultaneously took Zenith’s chemists seven years to develop. Thanks to their knowledge of cleaning technology and experimentations, they arrived at the formula for Radiant. The Horological community always wanted a superior performing cleaner that would restore parts to their original luster, especially antique movements that have not been serviced for a long time. Product 777 fulfills all the requirements that watchmakers and clockmakers want in a solvent base cleaner and more. This revolutionary new concept of cleaning and making movements shine exceeded everyone’s expectations. Radiant is formulated to clean movements that contain alloys of beryllium, nickel, copper and zinc. Product 777 is compatible with all Zenith’s rinsing solutions. 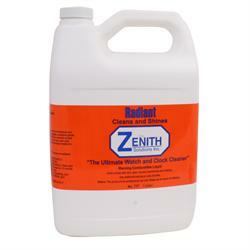 Zenith’s chemists developed Radiant to clean High End quality precision time pieces. They also wanted Radiant to be competitively priced so that everyone can take advantage of this superior product. Try it and you will be amazed at the results -Zenith guarantees that you will be satisfied with Radiants cleaning action or YOUR MONEY BACK! History of Zenith Solutions. Inc.
Zenith Manufacturing and Chemical Company was founded in 1934 by several entrepreneurs. 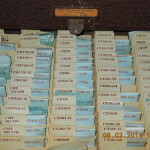 In 1972, the company was sold to one individual who developed many of the cleaning solutions that became useful to watchmakers and clock makers throughout the United States and Europe. In 1998, the present owner, a chemist, incorporated the company as Zenith Solutions, Inc., and describes the company as Producers of High Quality Products for the betterment of the Horological Industry through Modern Chemistry. Many famous watch and clock companies throughout the United States and Canada have switched to Zenith’s products. The reason is they took the time to compare Zenith’s cleaning solutions with products that they were using. They wanted cleaners that are environmentally friendly and very effective. Zenith’s Formula 67 and Drizebrite exceeded all their requirements. That is why they switched. Future Product Development by Zenith Solutions, Inc.
At the present time, Zenith’s chemists are developing a “new” rinsing solution for water-based cleaners. Those watchmakers and clock makers who use water-based cleaners are always asking “How can I be certain that there is no water droplets on parts after rinsing with water, because residual water will damage and corrode delicate movements?” Thanks to Modern Chemistry, Zenith Solutions, Inc is currently developing a safe and environmentally friendly “Rinse Away Water” Solution. This one step rinsing solution will dissolve and prevent any water droplets that would have remained on the movement after the water rinsing cycle. We are waiting for approval from several prominent master watch and clock makers before we make it available to the Horological community. At the present time Zenith’s chemists are developing new products. 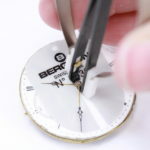 A Pre-Soak solution that is designed to pre-clean watch and clocks while assembled prior to the regular cleaning cycle. 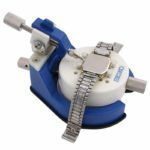 Once the watch or clock has been presoaked the watchmaker can readily see where the repair is necessary without having to deal with hardened grease and oil oi the movements. Presoaking will also facilitate the cleaning process. Product NO. 109 is an Epilame type coating that prevents oil from spreading when applied to strategic locations in a watch or clock. It will make the watch or clock last longer and keep more accurate time. (3) Most recently, a Master Watchmaker from a watch manufacturing company in Geneva came to their New Jersey repair center and ran tests on Formula 67. The results exceeded his expectations and the company has switched to Zenith cleaning products. Many Watchmaking schools throughout the United States are now using Zenith’s Formula 67 and Drizebrite solutions. Today’s students are tomorrow’s Master watchmakers and clock makers who want environmentally friendly and effective products.